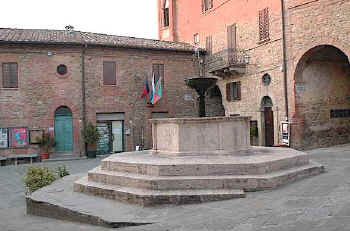 Panicale as an inhabited nucleus can be dated back to ancient times. As early as 2000 B.C., Indo-European herdsmen called Acherni and Italic people lived on the hill where Panicale is situated. Some 1000 years later, Etruscan farmers replaced the herdsmen and were later joined by the Romans. Historians believe that the name "Panicale" comes from the Latin words Pani calet, i.e. "to be in the heart of the god Pan", the patron of nature and forests. The names of the surrounding areas and villages are all of Latin origin. They include Gioveto, the god Jupiter, Missiano, the messenger of Janus, and Ceraseto, the place of Ceres. Many more are known. 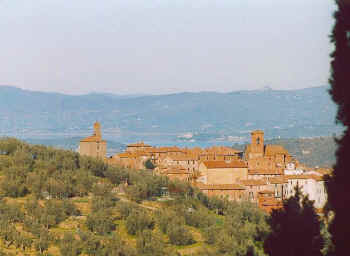 In the 9 C A.D., Panicale was already a castle, and 500 years later, the town was governed according to a constitution. Its defence walls still stand after numerous wars against Florence, Rome, Perugia, the Vatican State and other neighbouring towns in the area. 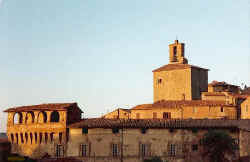 as are Scarperia in the Mugello, Loro Ciuffenna, Montefioralle, Poppi, Pitigliano, Cetona, San Casciano dei Bagni and Anghiari. During times of both war and peace, Popes and soldiers of fortune all lived in or passed through the Castle on their way to Perugia, Assisi, Florence or Rome. Some left still-visible traces of their more or less friendly visits. Around the 17 C, dwellings were permanently built inside or propped against the walls. As recently as 1898, the old moat was filled with gravel, leaving space for gardens and a ring road. The southern part of the ring road is called Fosso Largo (Wide Moat), and the northern part Fosso Stretto (Narrow Moat). Parts of the moat were turned in to gardens that were leased for 99 years to the owners of the houses. The lease expired in 1997, and the local council forgot to extend it. That meant that the property of the land automatically went over to the leaseholders. Rumour has it that some of the members of the city council responsible for the renewal of the lease were themselves owners of houses and leasers of gardens, and by forgetting the renewal, they assured themselves of their garden. Panicale has a population of 500 and can be entered through two gates: Porta Fiorentina, used when arriving from Florence, and Porta Perugina used when arriving from Perugia. There are a total of seven churches, not all of them in use. The largest church, San Michele, is used on Sunday mornings for celebrating mass in Italian, and in the afternoon for song and prayer. The church contains 'The Annunciation of the Virgin', a fresco made by the famous Renaissance painter Tommaso Fini, also known as Masolino da Panicale (1383 - 1447). He was a friend and possibly a teacher of Masaccio. When it comes to art, however, Panicale's pride is Pietro Vannucci, known as Il Perugino (1446 - 1524). His family originated from Panicale, but moved to the neighbouring town of Citta della Pieve. Il Perugino is probably best known for being Raphael's teacher. His 'Martyrdom of San Sebastiano', which was recently restored, is located in the Church of San Sebastiano. San Sebastiano is a small, romantic and extremely beautiful church right outside the walls of Panicale. Today, it is used mainly used for weddings. The Church of Sant' Agostino has been deconsecrated, restored, and is now a lace museum, showing off Panicale's lace tradition by day (Popes and Kings have ordered lace from Panicale). Occasional art shows and concerts take over by night. 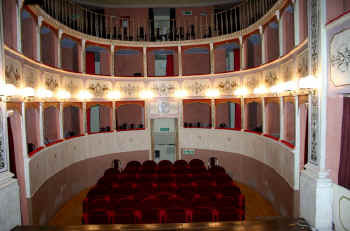 Panicale's newly restored theatre (Teatro Caporali) was originally built in 1690 by some of the area's most prosperous families. Today, it hosts concerts and plays from local and travelling ensembles. Panicale's local theatre group is still going strong, playing both classic and modern pieces. Of the 200 seats in the theatre, only 20 are located in the pit. The rest are in booths on three levels. Of artistic value in the theatre is the curtain painted in the early 1800's by Pier Vittori. It shows the soldier Boldrino Panieri, a Panicale native, receiving the keys of Perugia. The San Sebastiano church and the Caporali theatre are usually locked, but visits can easily be arranged through the tourist office. Click here for Panicale hotels, vacation rentals and holiday homes. Perugia Tourist Information © 2005 - 2018 ammonet InfoTech website design and promotion.